Happy Tuesday everyone! 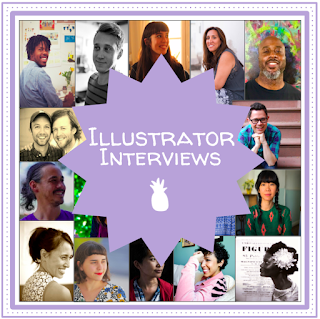 Today is a very special day for me because I am introducing Let's Talk Illustrators, a new series here on Let's Talk Picture Books featuring interviews with illustrators about their design styles, illustration processes, and formations of visual narratives. 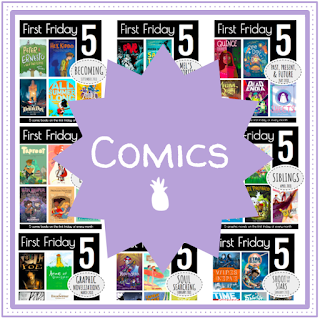 My hope is that the series will shed light onto the skillfully conscious (and wonderfully accidental) details that make picture books beautiful, unique, and full of story. 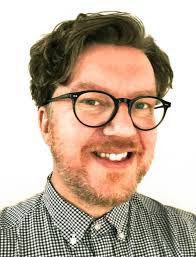 I couldn't be prouder to announce that my first feature is Ged Adamson! 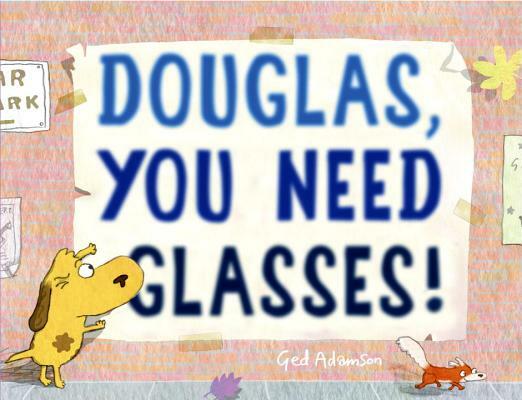 You might know Ged from Elsie Clarke And The Vampire Hairdresser and Meet The McKaws, but his latest picture book Douglas, You Need Glasses! is hands-down his best yet. The visual continuity is beyond impressive, and it's been so enlightening to learn how Ged's process changed over the course of making the book. 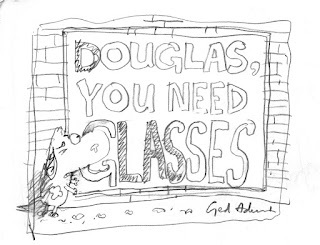 Meet Douglas, a dog with a big problem: he needs eyeglasses but doesn’t know it, and his bad eyesight tends to land him in some pretty hairy situations. Douglas chases leaves that he mistakes for a squirrels, walks through wet cement because he can’t see the warning sign, and annoys the neighbor’s dog by mistakenly eating out of his bowl. 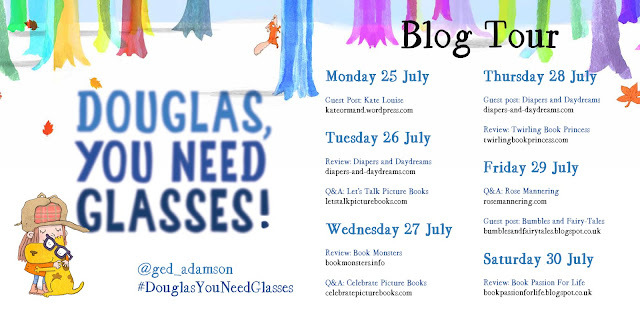 Without further ado, let's talk Ged Adamson! LTPB: Hi Ged! Thanks so much for being the first interview in my Let’s Talk Illustrators series! LTPB: I want to kick things off by getting to know Douglas. How did Douglas as we know and love him come to be? How many incarnations did you go through before you had him just right? 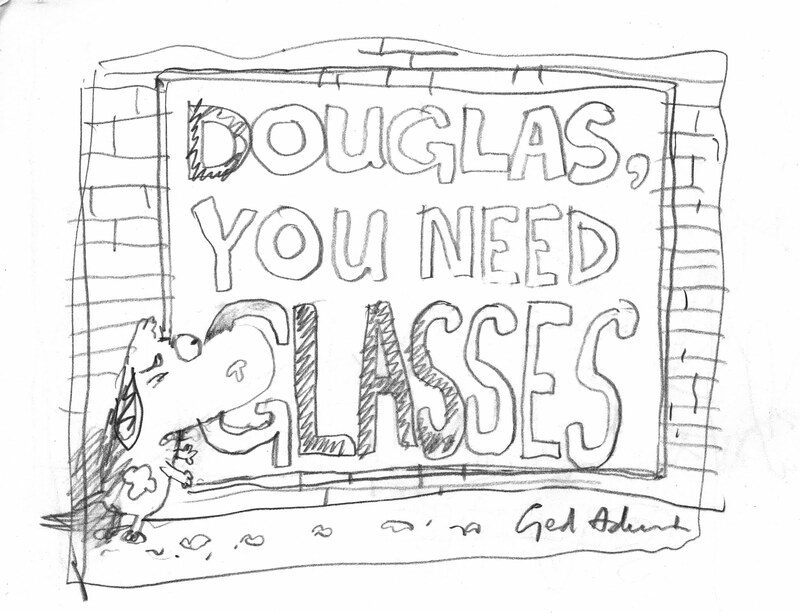 GA: Douglas started with a doodle. I think I was in a café down the road from where I live. 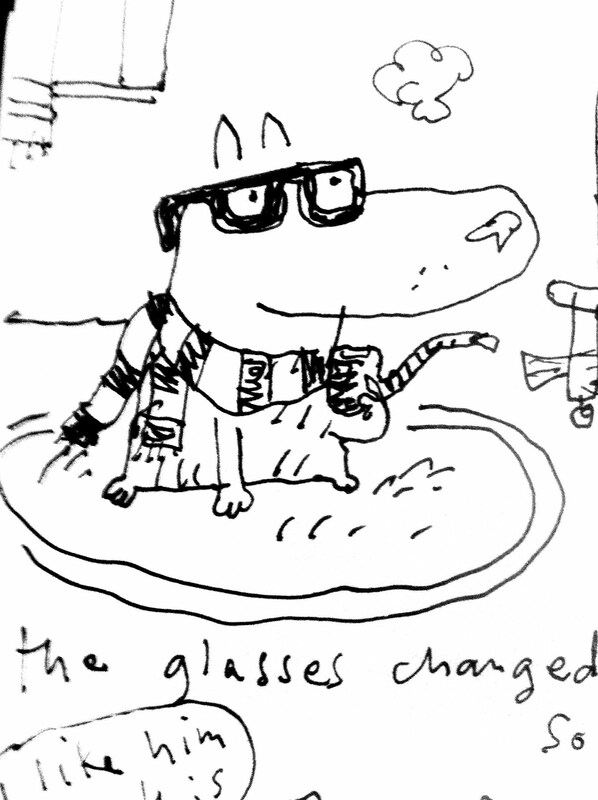 For no particular reason, I drew a dog in a scarf wearing glasses and smoking a pipe. 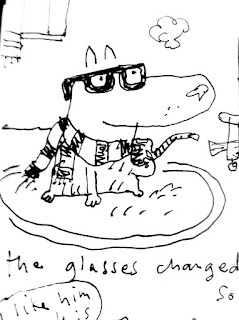 I was trying to come up with new story ideas at the time so I suddenly thought maybe I could do something with this dog. The first thing was to decide what color he would be. Originally I thought he could be white with brown patches but then I realized this wouldn't go so well on white backgrounds. So I settled on the mustard color he is now. 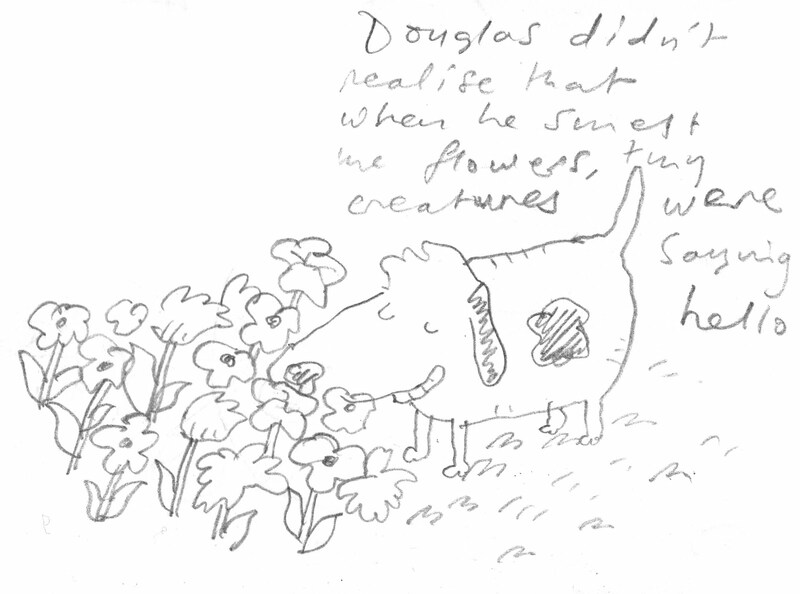 When Schwartz & Wade said they'd like to do something with Douglas, I still hadn't nailed the story. We worked on getting that right over the following months. It's was such a great thing to be able to go through this process with Lee Wade and art director Rachael Cole. I learned so much. Should have kept the pipe though. LTPB: How did the art change, and how did your previous books inform the art in Douglas? 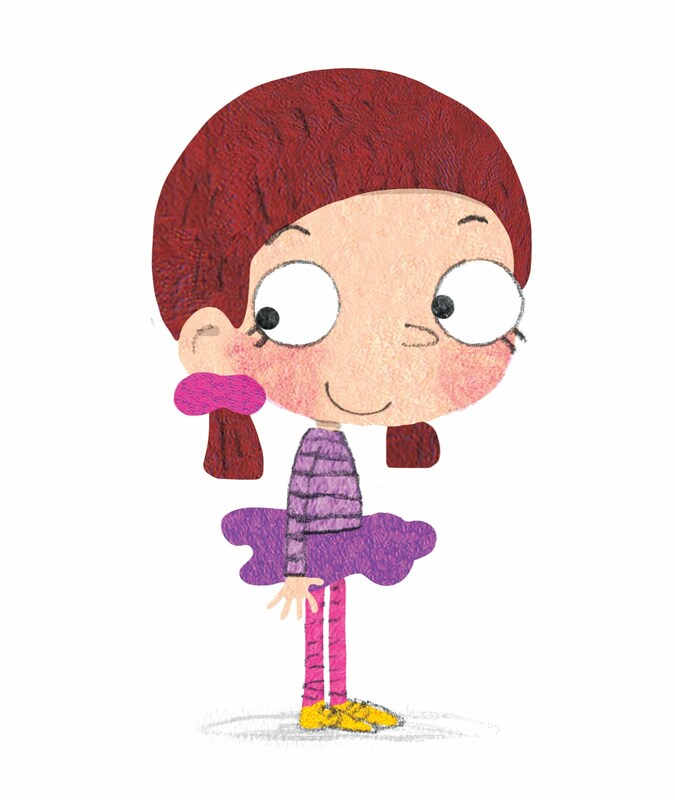 GA: The early Douglas and Nancy had eyes that were smaller and closer together than the final versions. Their heads got bigger and their bodies smaller. Nancy's feet got smaller too. I'd changed from ink to pencil so over time I got more confident with that. Also, if you look at my first book Elsie Clarke And The Vampire Hairdresser, you'll see everybody's eyes are dots and I was using lots of patterned backgrounds. I had to redo a couple of things because the line looked darker and thicker than the style of rest of the book. And because you're spending up to a year on the illustrations, you have to make sure the most recent art is matching with art from months before. Also at this time I was trying to develop my style and change the way my characters looked. I'd just got a deal for a book about pirates (Meet The McKaws), and I asked the editor if she'd mind if I scrapped all the original art and started fresh. Amazingly she said ok. So while I was developing Douglas, I had this whole project going on at the same time that allowed me to get comfortable in a new style. 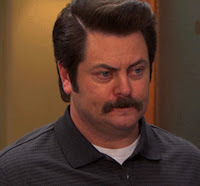 Incidentally, when Douglas says 'Definitely a horse' he really looks like Ron Swanson. I didn't plan that, it's just a bit of magic that happened. 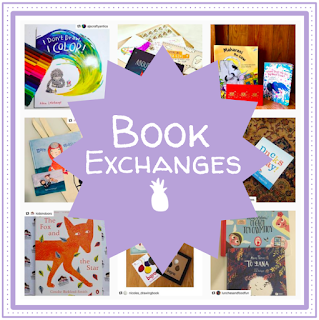 LTPB: I love talking to author/illustrators specifically because they get to oversee the creation of the whole book. What benefits are there to writing AND illustrating? 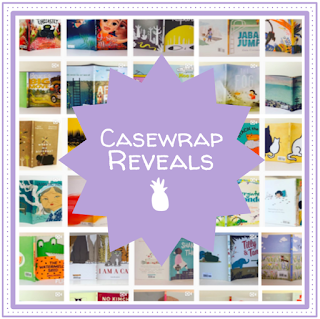 GA: I love hearing how other people do their books too! Doing both the words and art has big benefits for me. The text never stays the same from day to day. As I work on illustrations, I'll get new ideas for what the words should do. And one of the things you definitely have to be when you're working on a book is ruthless. If something isn't helping move the story on, or if it's meant to be funny but is just confusing, then you have to get rid of it. This must be a tricky thing when there's two of you. If you become attached to a particular bit of art or a certain bit of text, somebody saying "If we lose that, then this part will work better" could turn into a battle! I've collaborated in this way on other creative projects, and it's fine, that's the process, but I love with my books that I'm the decision maker on both art and words. Until, that is, the book gets taken on by a publisher! Then there's a lot of collaboration with your editor and art director. But that's a slightly different thing, and I do really enjoy that. LTPB: I love the visual continuity in your illustrations--we see Douglas track mud through three whole spreads, and the fact that Douglas consistently mistakes a leaf for a squirrel the whole book is hilarious. How do you ensure a continuous visual narrative? GA: Thanks, it's great when readers notice that stuff! Originally, I had the mud stop with the skate park but it was Lee I think who said lets have him trail it through the neighbor's house, too. It's little things like that that add to the comedy. Continuity is really important. That's why I love what happens after the book gets signed up. If you're working with talented people, you end up with something much better than you had at the submission stage. GA: I generally use 4B pencils and watercolor. I also use a scanner and Photoshop! I think pencil is a lot more flexible than ink - which is what I used to use. You can be more subtle with it. Watercolor is lovely to use, and it gives everything a nice texture. I’m working on a new story about a rainbow and I’ve had a lot of fun playing around with different blobs of color and making them run into each other. I’m determined to experiment more with different media. A lot of illustrators that I admire really mix things up and aren’t afraid to use all kinds of methods to create the images in a single book. I use Photoshop like most illustrators do now but I like to do most of the art outside of the computer. That’s not to say that I don’t love a lot of purely digital stuff - I do - but i think my own work is strongest if I can keep a more ‘organic’ feel to the illustrations. For the blurred letters idea for the cover of Douglas, I tried things like scanning the title letters a couple of inches from the glass so it wouldn’t be in focus - rather than immediately go to ‘blur’ in Photoshop. LTPB: What can you tell me about Shark Dog (HarperCollins, Summer 2017) and Want to Grow (Boyds Mill Press, Fall 2017)? Do you have something new lined up for Douglas? GA: Shark Dog is looking so great! It’s about a boy and his explorer dad who discover a stowaway on their boat after they leave a remote island. He’s half shark and half dog - but don’t worry he’s the friendliest animal you’ll ever come across! They take him home and Shark Dog explores this new strange world. 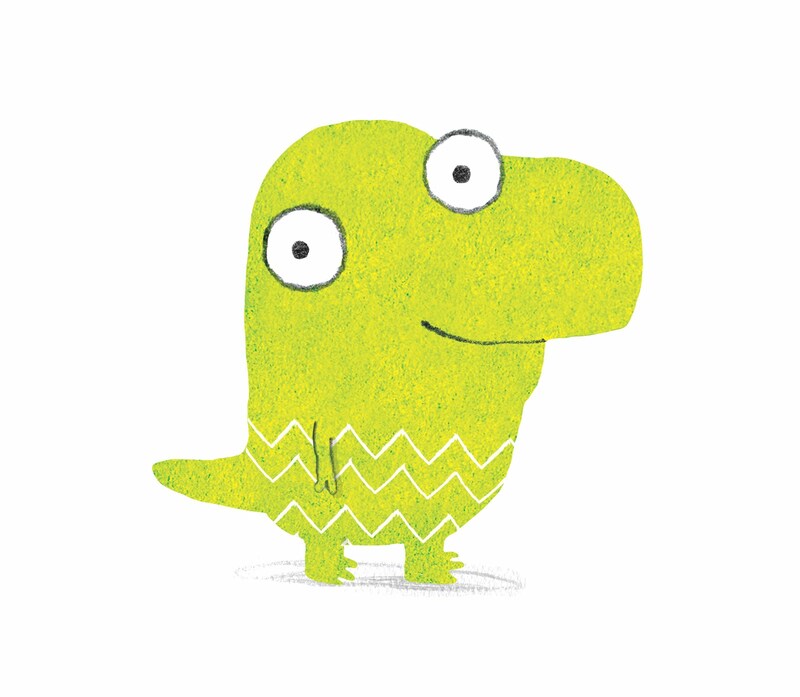 I don’t think I’m allowed to show him yet though - he’s top secret! 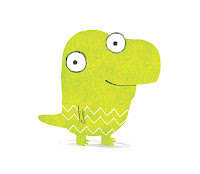 I Want To Grow is about a dinosaur called Herb who isn’t growing as fast as his human friend Muriel. He resorts to ever more desperate measures to catch up. Maybe it’s bad to say this about your own characters, but I love Muriel and Herb - they just make me laugh! 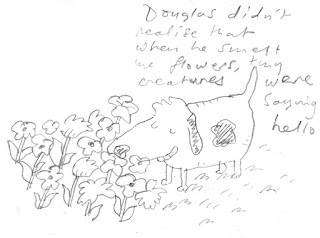 I’d love to do another Douglas book but it’s early days still, I’ll be able to tell you in a few months whether there’ll be a new one. Fingers crossed though. LTPB: The last question I’m going to ask all illustrators who participate in the series is, if you could have one illustrator (other than yourself!) illustrate your picture book biography, who would it be? GA: That’s easy - it would be Beatrice Alemagna. I love her work so much. She creates the most beautiful images that are full of humor and emotion. Her art is totally from within herself - it seems to be anyway. It has a quality of the past. When I see her stuff it makes me feel like I do when I see the great Milton Glaser’s work. Just such strength of design but overflowing with warmth but nothing is ever ‘cute’ in a traditional sense. There’s often a melancholy to her images too and I love that. I could go on and on! Thank you so, so much to Ged for stopping by Let's Talk Picture Books! Douglas, You Need Glasses! published May 2016 from Random House. Special thanks to Ged for use of these images!